Tween Tuesday is a weekly meme to highlight great reads for tweens. 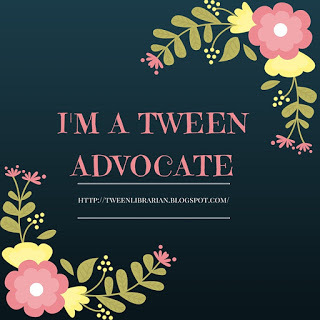 Join the fun and add your own Tween Tuesday post below. This Tween Tuesday post is part of the Spaceheadz Blog Tour! over a physical book with newest media technology that kids love! 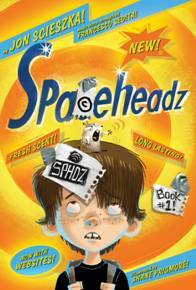 GreenBeanTeenQueen Says: I am a longtime Jon Szieszka fan, so I was excited to check out Spaceheadz. And this new series does not disappoint. There's plenty of the trademark humor that fans will expect and many laugh out loud moments. The aliens in Spaceheadz have been feeding off the airwaves from Earth, meaning they think all of our commercials, jingles and ads are real. They use these slogans in everyday conversation which rarely make any sense and lead to very funny situations. Agent Umber is the agency assigned from the anti-alien agency to track down the alien signal. But Agency Umber is so far down on the agent list, his phone is a pickle. He's pretty bumbling and he's slow to figure out what's going on, which I'm sure will leave readers laughing. Spaceheadz also is an interactive series, with websites mentioned in the book being online and ready for readers to explore. There are also tons of illustrations that fill the pages, so there are lots of great hooks to pull in even the most reluctant reader. Fans of The Time Warp Trio series will love it. The humor is perfect for tweens and parents and would make a great read aloud or a read alone. Give this one to the hard to please tween and they'll be sure to enjoy it. help stop the Earth from being turned off. the government is doing to protect the Earth from the alien menace. Michael K.'s fifth-grade class website. How funny! That is my Tween Tuesday choice as well today. Here's the post. Added my link to the linkything. Spaceheadz looks really good and funny... I should add it to my ever-growing list. I've never read any of Scieszka's books but I love what he does with Guys Read. So important. I should check out his books sometime. My son loves Scieszka'a picture book Henry P. Baloney and I love this author also! This would be a perfect book for a friend whose son is a 5th grade reluctant reader. Thanks so much for the great post!